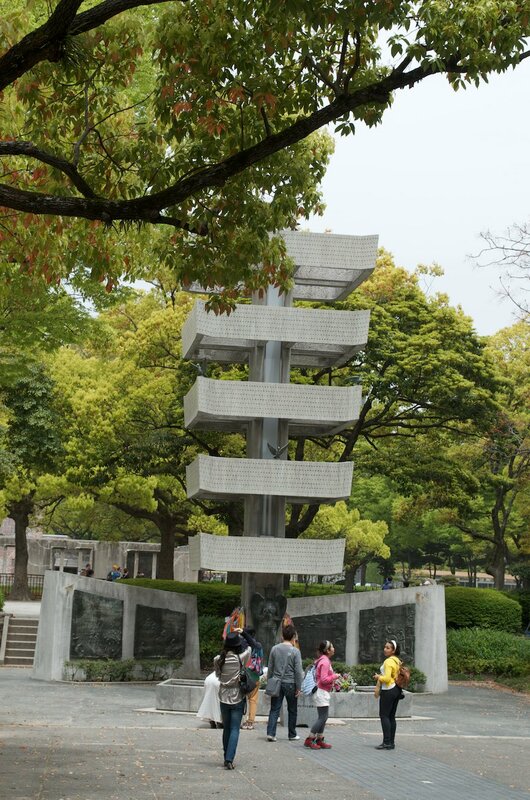 Hiroshima Peace Memorial Park (広島平和記念公園) is a large park in central Hiroshima City situated where, under the hypocenter, nearly everything was incinerated by the first atomic bomb attack in history on August 6, 1945. The park itself is dedicated to memorializing the horrific human cost of this action so that this event is never again repeated. The heart of the park is the saddle shaped cenotaph which contains the names of the victims. A memorial ceremony is held here every year on the anniversary. Throughout the park are memorials built to honor those who lost their lives. The story of Sadako Sasaki who died of leukemia 10 years after the bombing still inspires the folding of millions of origami cranes every year. 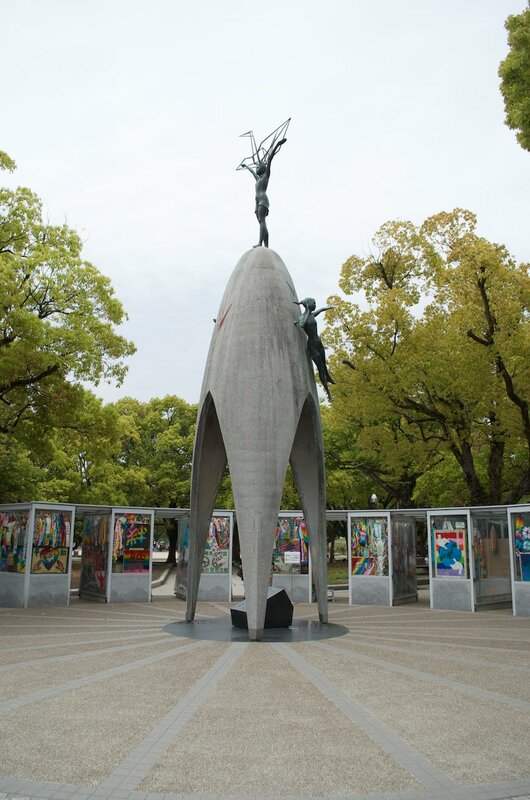 The efforts of countless people from Japan and abroad are displayed around the Children's Peace Monument. The memorial mound contains the ashes of an estimated 70,000 unidentified victims. The Children's Peace Monument was built with donations from school children who where touched by her story. Sadako Sasaki, a young girl who died of leukemia, believed that if she folded a thousand cranes then a crane would grant her wish of becoming healthy again. The statue of her holding a crane above her head crowns the monument. Millions of cranes strung onto lines of a thousand by people from around the world are displayed every year in the park. They are later recycled and sold in the gift shop. The twisted and blown out remains of the Atomic Bomb Dome are a symbol of the devastation the city faced after the bombing. The remains of the Prefectural Industrial Promotion Building was declared a UNESCO World Heritage Site in 1996. Its dome was the target of the atomic bomb attack on August 6, 1945. Koreans working as forced labor in Japanese factories suffered greatly because of the attack. After some political disagreements, the monument (erected in 1970) was moved into the park in 1999. It is located on the western riverbank to the west of the Children's Monument. This quiet but captivating hall is a simple but effective space to mourn the loss on August 6, 1945. If you don't want to see the museum then you should at least come here. 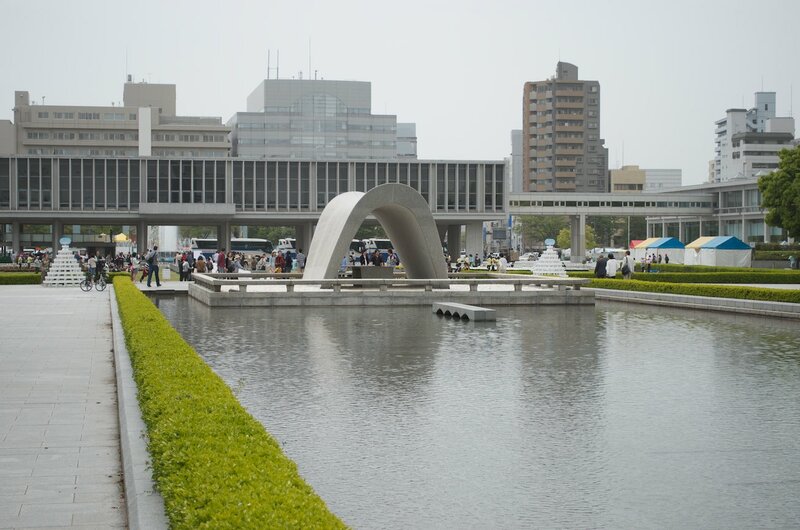 Hiroshima Peace Memorial Museum overlooks the Memorial Cenotaph in Hiroshima Peace Memorial Park. 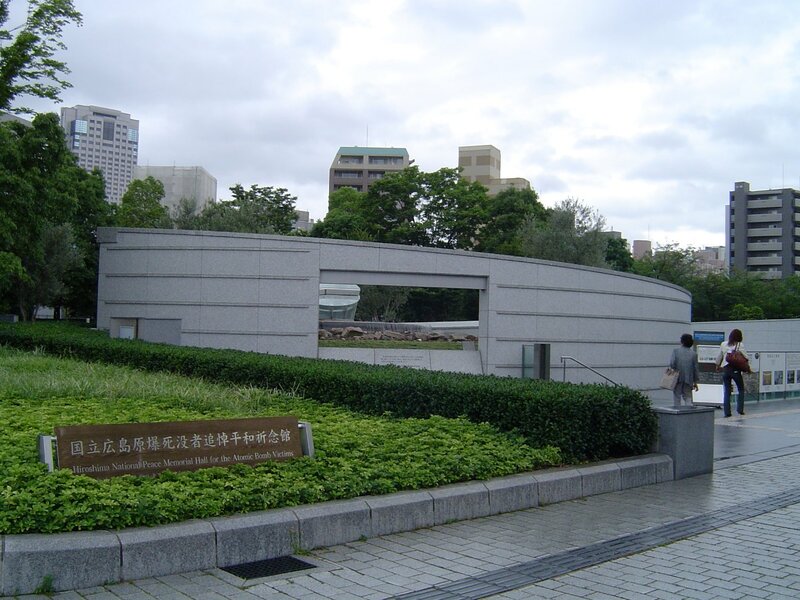 It is the primary museum related to the atomic bombing in Hiroshima. The museum explains quite clearly the reasons why Hiroshima City demands an end to nuclear weapons on the anniversary of the bombing and after each nuclear test. The Memorial Cenotaph contains the names of those who lost their lives as a result of the bombing. Its saddle shape is in the image of ancient houses in Japan. 88 volumes containing over 247,000 names have been placed in it. In 2006, a blank 89th volume was added for the many unknown victims. The word written on it read, "Rest peacefully; for we shall not repeat the evil." The Peace Flame will burn next to the Pond of Peace until the last nuclear weapon has been destroyed. Near the museum there is also a clock that counts up from the last nuclear explosion in the world. The Peace Bell is at the northern tip of the park along with the Peace Clock. The sounds both make were selected as one of a hundred sounds Japanese people wish to preserve in 1996 by a government survey. The former Taishoya Kimono Shop located opposite the Children's Peace Monument was built in 1929 and has been the park's rest house and gift shop since 1982. The building was repaired after the explosion. Only the exterior and one person in the basement survived. 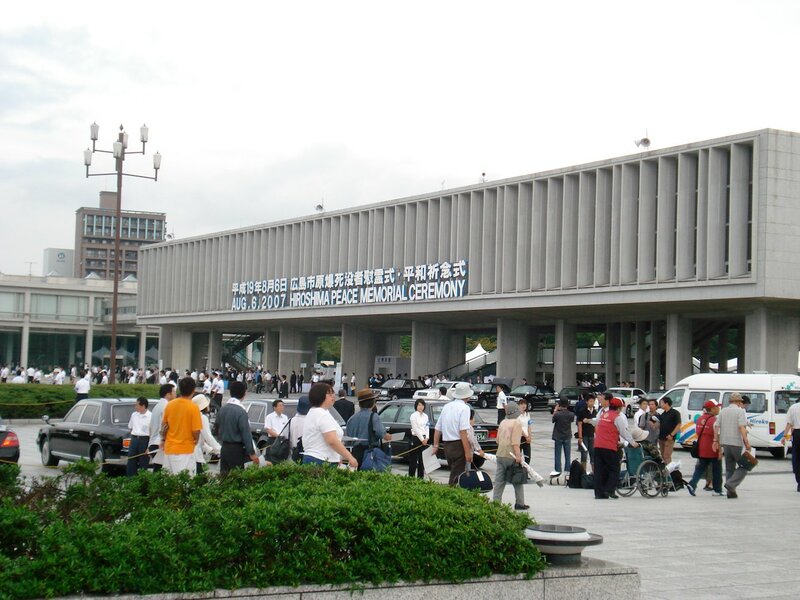 Numerous conferences are held in the park every year in the west wing of the Hiroshima Peace Memorial Museum building. 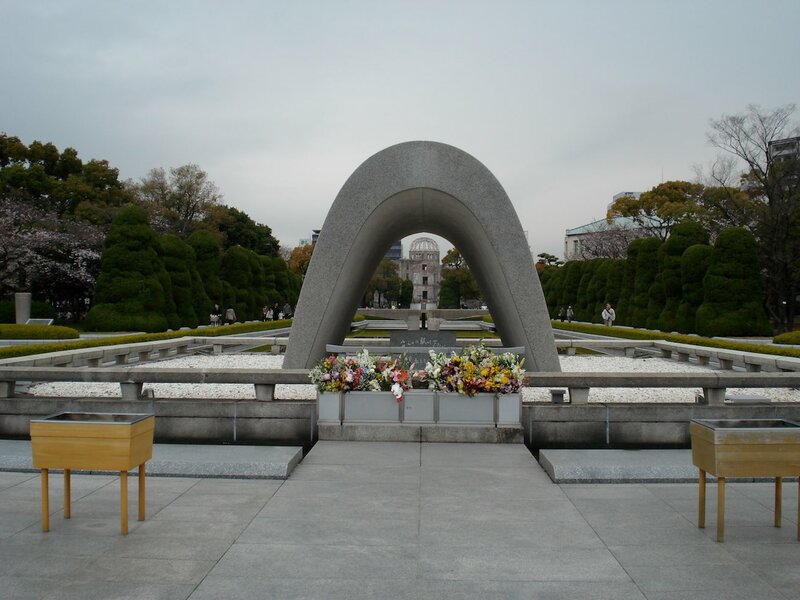 The atomic bombing is officially marked in ceremonies every year on its anniversary. 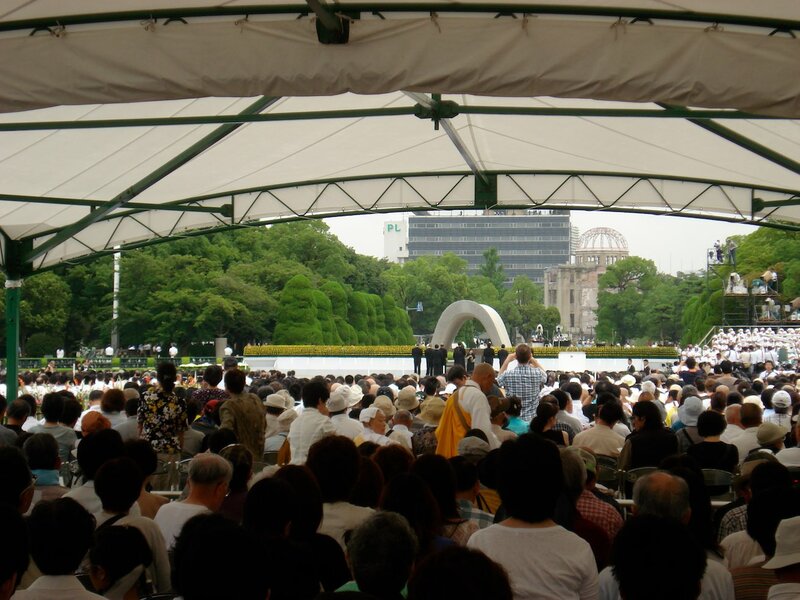 The largest of which is the Hiroshima Peace Memorial Ceremony that occurs in front of the Memorial Cenotaph starting at around 8 in the morning on August 6. Since 1947, the Mayor of Hiroshima has delivered an annual Peace Declaration during this ceremony. On the night of August 6, small candles in paper boats are released down the river to pray for peace. During early April, the cherry blossoms come out across Japan and the Peace Park is no exception. Along the Motoyasu River (east side) is a long row of cherry trees. Many people come here to enjoy spring and have a picnic under the flowers. 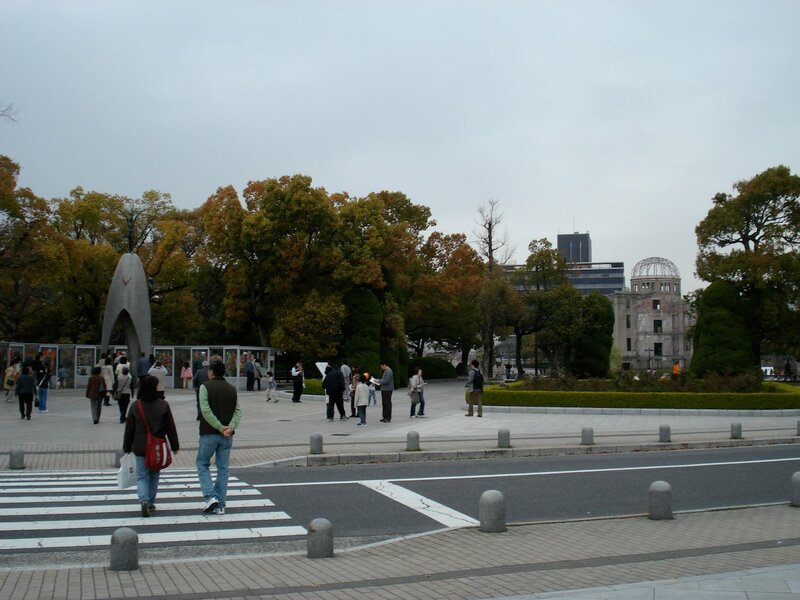 Hiroshima Peace Memorial Park is located at the western end of the shopping arcade on Hondori. 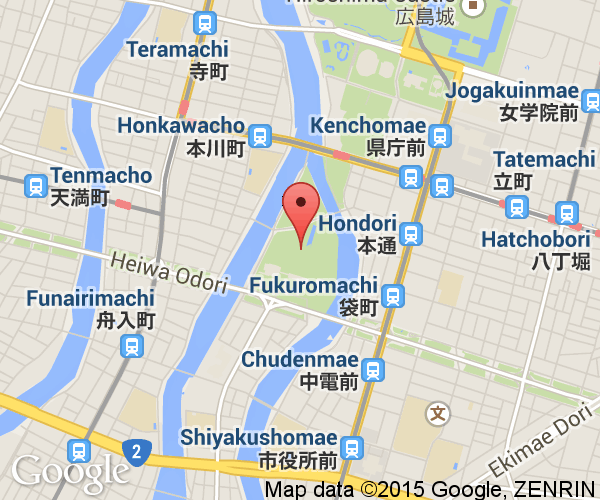 Hiroshima Peace Memorial Park is a 5 minute walk from the Hiroshima Bus Terminal in Sogo. Simply enter Shareo, the underground shopping mall, to cross the street and follow the signs. Note: While streetcars are very convenient it is much faster to go to Miyajima by JR trains.